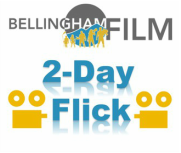 5﻿Bellingham Film is proud to present the newest addition to our line-up of film-focused events, 2-Day Flick! Teams from throughout Bellingham and beyond will devote one weekend to creating short films shot in our area in only two days. Each team will be given three prompts which must be included in their film. Genres will be chosen at random at the kick-off event on April 15th. Don't have a team or want to try making films with new people? No problem! We are accepting individuals to be assigned to teams on April 15th. As a special deal, 2-Day Flick sponsor, Current Media, will be renting equipment at deeply discounted prices to all participants (first-come-first-served). A portion of the proceeds will go to one entrant chosen by a panel of judges at the screening on April 17th. In addition, special prizes will be distributed from sponsors of the event (TBA).